Sweet potatoes are a glorious thing. They’re vegetables. But they taste like candy. How can you go wrong with that? They’re 10 times better than regular potatoes, and also a lot more nutritious. Win! There are a lot of weird things about California, and one of them is sweet potatoes. I went to the supermarket to buy sweet potatoes for these burgers and was quite perplexed when the bin labelled as supposed “sweet potatoes” was full of white potatoes, very much lacking the normal orange sweet potato color. The bin next door was full of “normal” sweet potatoes, so at first I thought they had mislabled the white ones. But the orange ones were labeled “yams.” I’ve always known yams to be sweet potatoes’ large and in-charge gigantic cousin, so now I was just confused. I ended up buying the “yams,” since they looked a whole lot like sweet potatoes to me. As it turns out, the grocery store was half right and half wrong. There actually are white sweet potatoes (which I’ve never seen anywhere else in the country), which have a drier, more potato-like texture, but are sweet like the orange variety. Yams aren’t common in the US and are usually only found at ethnic specialty stores. But Americans are dumb, and needed something to differentiate between the two types of sweet potatoes, so they started calling the orange ones yams. Huh. So I bought sweet potatoes after all. I made these burgers about 5 years ago, and hadn’t had them since. When we moved, I uncovered a binder full of old collected recipes. I remembered these being really good, so I decided to make them again. Heat 1 teaspoon olive oil in a large skillet over medium-high heat. 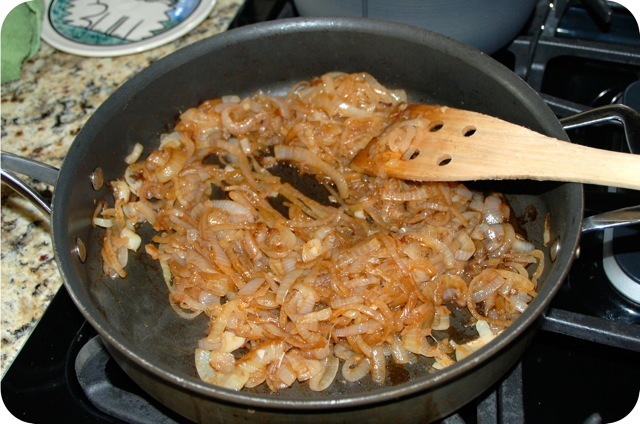 Add sliced onions to the pan and cook until soft and browned, stirring occasionally, about 12 minutes. Stir in vinegar, sugar, and salt, and cook and additional 30 seconds until vinegar is absorbed. Transfer the onions to a bowl and cover to keep warm. Wipe pan clean with a paper towel. Meanwhile, place sweet potato in a large medium pot and cover with water. Bring to a boil. Reduce heat, and simmer 15 minutes or until tender. Drain. Add additional oil to the pan and heat over medium-high heat. Add onion and garlic to pan and cook until softening, about 5 minutes. 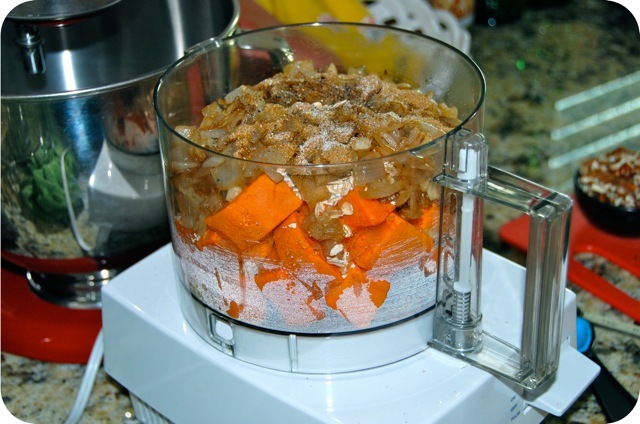 Place potato, chopped onion mixture, oats, cumin, salt, and pepper in a food processor and process until smooth. 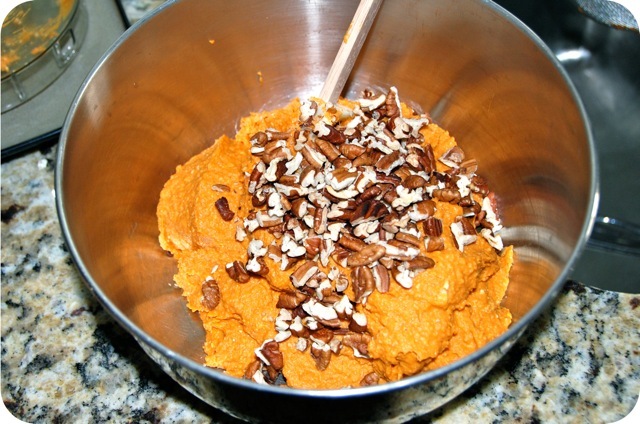 Place potato mixture in a large bowl and stir in nuts. Wipe pan clean with a paper towel. Heat 1 1/2 teaspoons oil in pan over medium-high heat. Add 3 patties to pan and cook 4 minutes or until browned. 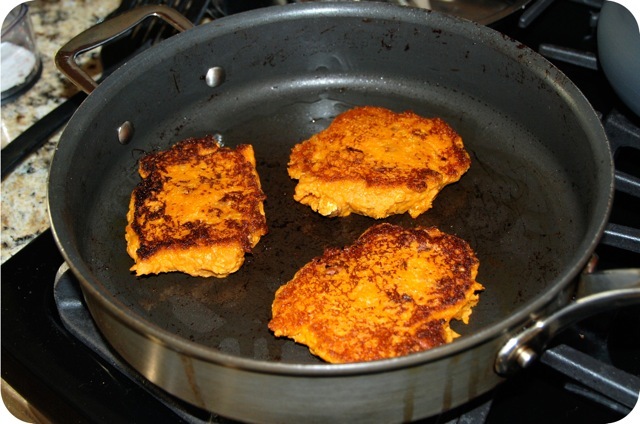 Carefully turn patties over and cook 3 additional minutes or until browned. Repeat procedure with remaining 3 burgers. In a small bowl, combine ketchup and sriracha sauce and mix well. 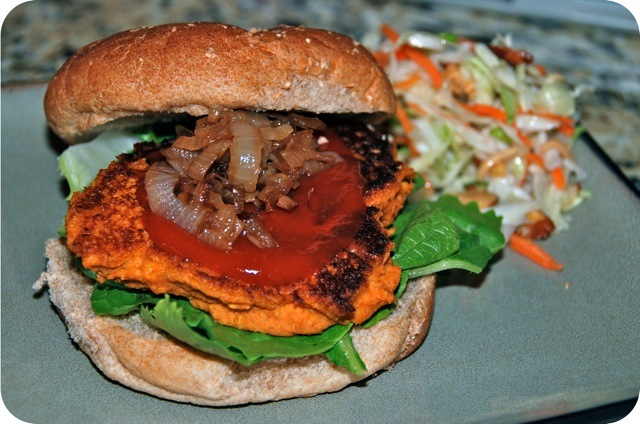 Serve burgers on buns with lettuce, sriracha ketchup and caramelized onions! The burgers came out great and just as I remembered them. The crunchy, toasty pecans really make the burgers! Nick enjoyed them, but of course asked, where’s the meat? Which made me think, these would be totally awesome with bacon on top! My next mission? Test out white sweet potatoes!! they were really good! Was that seriously 5 years ago? 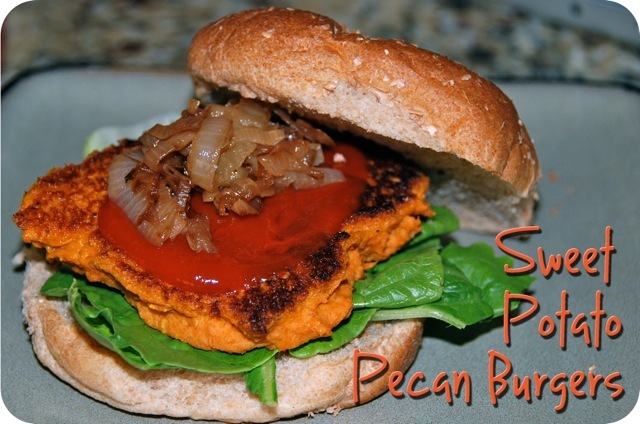 I’ve had many a veggie burger in my time, but never a sweet potato burger! It looks fantastic! I’m a big onion fan, so I am drooling at the onions in all these pictures. Adding this to my “must try” list!